In this case, the Athens games of 2004. 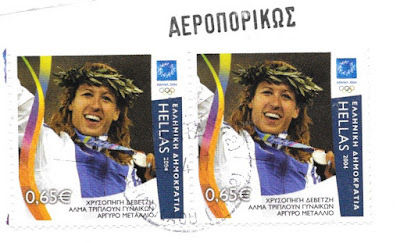 This stamp celebrates Greek athlete Hrysopiyi "Piyi" Devetzi's silver medal placement in the triple jump event. Her story ends a bit sadly with a ban and revocation of her bronze medal in the 2008 Olympics. Read more at wikipedia. For more links to stamps with 'O' topics, head over to Sunday Stamps. I was quite surprised to read about the revocations of medals (some of them!). Top athletes must be under a lot of pressure to perform well - enhancements must be such a temptation. and yet her stamp lives on! True, and she still has her silver medal. that is a pity of what happens in the sports' world. But as violet said, at least her stamp lives on! Certainly impressive to be alive and be on a stamp. I think that is true for a lot of countries - at least after someone has died they can't do anything that would disqualify them from being considered. I think it is such a nice idea to do Olympic winner stamps like this - I think the UK created a stamp for the gold medal winners that was issued *the next day*, and they also had. postbox painted gold in their home town. Absolutely - must be amazing to see yourself on postage. 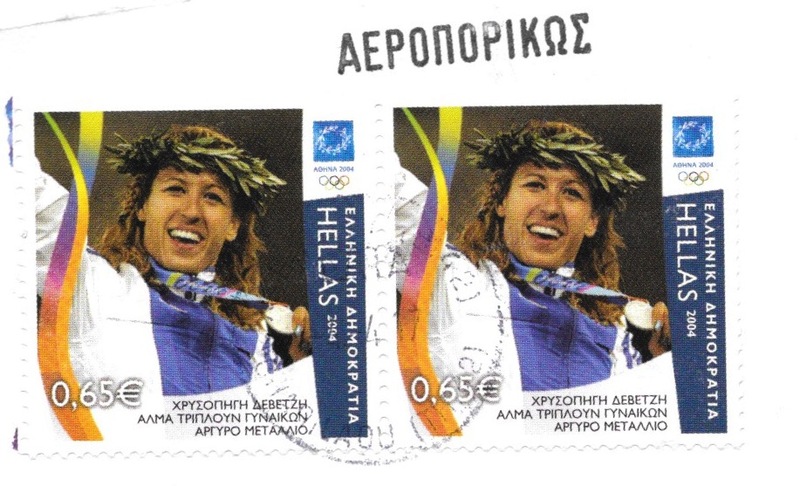 There were so many Olympic stamps to chose from that I decided to give them a miss. Had never seen this one though. Yes, a lot of winners = a lot of stamps.